It's true the Amazon enabled Alexa voice commands on its Android app, but that won't replace the smart speakers yet. Two voice assistants seem to drive sales of smart speakers these days, Google Assistant and Amazon Alexa. If you happen to a fan of the first, you'll be pleased to know there are a few JBL smart speakers on sale in the United States that might interest you. Abt, B&H, Best Buy, Newegg, and Verizon are now selling the JBL Link series smart speakers at deep discounts. The cheapest of the three smart speakers, the JBL Link 10 usually sells for $150, but you can get one from any of the retailer mentioned for just $100. Next in line, the JBL Link 20 is on sale for $150, so you'll be saving the same amount if you buy it – $50. Finally, JBL Link 300 is up for purchase for $200, $50 cheaper than the MSRP. 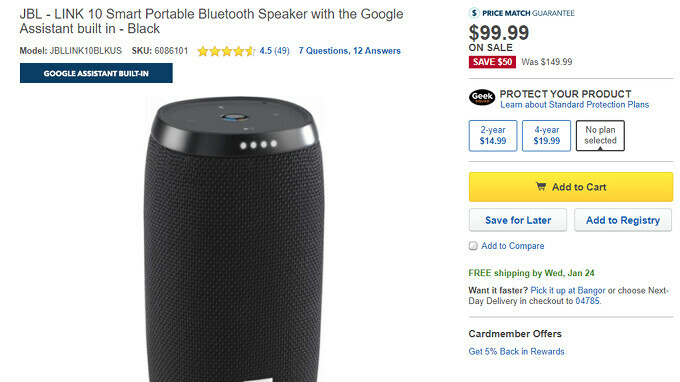 Keep in mind that in some cases, only the black color version of the JBL Link smart speakers is on sale, whereas the other colors are available for purchase for their full price.